Is it wrong to J-walk into church? …. because I do it just about every Sunday. Is it wrong to curse at people on the road while driving to church? Cause… maybe that’s happened once or twice. On a scale of one to total jerk… how jerky is it for me to blatantly roll my eyes at the lady on the spin bike next to me who is flirting with the obviously married man on the other side of me? Do I really need to be in the middle of this interaction? It’s 7 in the morning! Come on. Please. Oh! And while we’re on the subject… if you take your shirt off during spin class and decide to just ride it out in your sports bra…. I’m going to try very very very hard not to label you as an attention-seeking-lady-exerciser. Do not like. We’re all hot and sweating lady…. keep you shirt on. There should be a rule. There’s gotta be a rule. Also… exactly how much of this batter can I spoon in my mouth after spin class and before rushing off to J-walk into church? That’s the real issue. The answer? About two cupcakes worth of batter… which may or may not lead to a belly ache. Don’t do what I do… J-walk, curse, or roll your eyes at attention seeking, inappropriately flirty strangerladies. Be a nice person instead. I happen to love making cupcakes exactly 47 times better than I like to actually eat cupcakes (cupcake batter excluded). Making individual cake treats is cathartic. They all looks the same with slight differences and imperfections. I love to line them up and take in their differences…. then cover them in frosting. These cakes themselves are a brown sugar and buttermilk cake. The addition of brown sugar mocks the dulce de leche flavors just slightly. The cakes are more of a pound cake consistency and not so much a fluffy cake mix cupcake. The frosting is a combination of three fine fats: butter, cream cheese and dulce de leche. Only the hideous addition of sardines could make this frosting something other than delicious. Wait… do you know what Dulde de leche is? Dulce de leche is very similar to caramel. It’s sweetened condensed milk that has been cooked down until the sugars have darkened to a rich caramel. It’s sweet and thick and perfectly acceptable to bathe in. I’m not saying you shouldn’t make your own… you look perfectly capable. I’ve just never done it… so I’ll leave you to google and experiment with that whole thing on your own. Go with God. … and I love you. Cake with cream cheese and caramel. Please don’t make me twist your arm… just get on this. You might also like to know that I made these Dulce de Leche Sandwich Cookies. If you’re going to get the jar… you might as well go hog wild. Add half of the flour mixture to the egg and butter mixture. Beat on low speed and slowly drizzle in the buttermilk. Beat until just incorporated. Stop the mixer, scrape down the bowl and add the rest of the dry ingredients. Beat on low speed until just incorporated. Remove the bowl from the stand mixer and finish incorporating with a spatula. Try not to over mix the mixture. Place cream cheese in the bowl of an electric stand mixer. Beat on medium speed for about 30 seconds, until very soft and pliable. Stop the mixer, scrape down the sides of the bowl and add the butter and dulce de leche. Beat on medium speed until well incorporated. Stop the mixer and add the salt and powdered sugar. Beat on medium speed for about 3 minutes, until fluffy and lighter in color. Generously spoon frosting on top of cupcakes, or use a large frosting tip to pipe on frosting. For garnish, I heated a few spoonfuls of dulce de leche of a low flame until just pourable. Then I drizzled it over the cupcakes and topped with a few sprinkles. Add a few sprinkles of fine sea salt if you’re feeling fancy. I stored the cupcakes in the fridge for an hour to chill the frosting slightly. I like to enjoy my cupcakes within two days of preparing them. Feel free to wrap and refrigerate them because of the cream cheese in the frosting. Let come close to room temperature before serving. Summary: Sweet Caramel Cupcakes. Love. I’ve made dulce de leche in a pie plate in the oven and it took forever. I want to try with a can but I have the same fear that you do…I’ve thought about hiding in the other room and only coming out when I know it is done but I’m convinced that that will be the time it explodes and takes my face off. Try doing it on a double boiler. The problem is that if the can is touching the bottom of the pan (where the heat is), the can and contents get too hot. I made mine in a double boiler (with some water in the top portion as well). No Explosions. Three hours later… beautiful dulche de leche! I love every kind of cupcakes but these are sooo beautiful and delicious! They are perfect! you just described my sunday morning. spin & baking are both incredibly addictive! Definitely no arm twisting necessary. This looks stupendous! Dulce de Leche is my jam. Let the record reflect that sports bra alone does NOT an acceptable workout outfit make! PS thank you thank you THANK YOU for these. I want to make them like…now. Haaaave mercy. /Uncle Jesse I’m not usually big on frosting, but drizzle caramel over anything and I’ll inhale it. These are gorgeous! Problem #1: I have no buttermilk or brown sugar. Problem #2: There is a container of dulce de leche sitting in my fridge, completely unattended. Oh wow, could these look any more delicious? I’ve been looking for a new cupcake recipe for a while now, and I think I’ve just found it. I am having a party this Sunday. 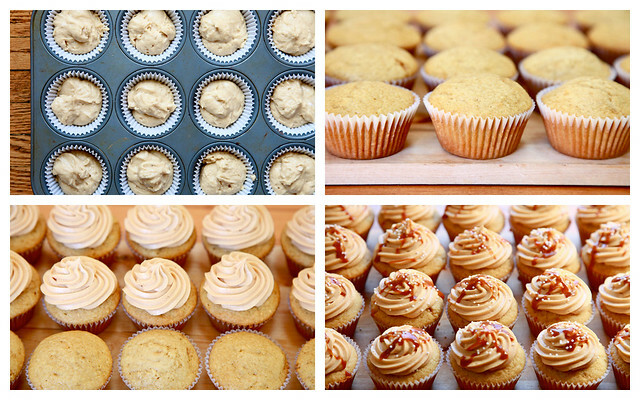 I am making banana cupcakes galore starting Wednesday. 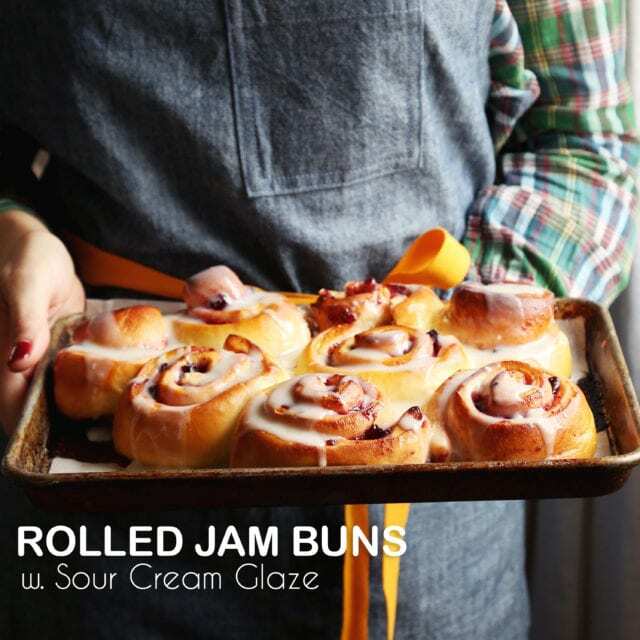 But now I want to make these too! I wonder if I can fit them in…did I mention I’m making sugar cookies, gingerbread cookies, and date oatmeal cookies on Tuesday? And Monday is going to be spent digging up my yard to make a pretty pretty flower bed. Busy, Baking, and Beautifying. And now you go and show me these yummy treats and make me want to add to this craziness. Well, it is my own fault for visiting your site, I always want to make the things you post about! The woman after my own heart. These look divine. Can I come over for cupcakes sometime? maybe the chick had a bee in her shirt? cut her some slack. I was just about to post the exact same thing! Delayed jinx.